So can you tell me the difference? 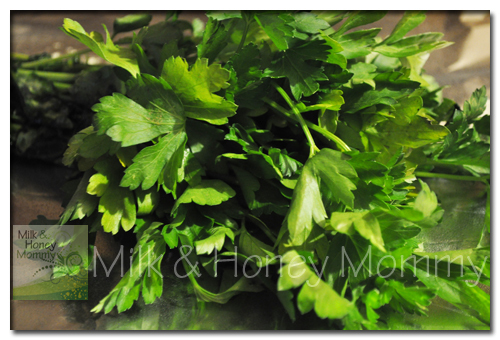 One day, I was asked about the difference between curly leaf parsley and flat leaf parsley (a.k.a. Italian parsley). The answer I gave was “the taste.” Well, duh! Only, I didn’t think about what I had answered until a while later and realized how silly it sounded because I didn’t offer any examples or an explanation. Interestingly enough, the person who asked me the question seemed satisfied with my answer. Hmm, or I guess there is a possibility she could have been struck silly by how obvious it was what I said. Anyway, there are no redoes on that one, but it did get me to thinking and I realized up until now, I have been a flat leaf parsley snob – I’ve preferred to only use flat leaf parsley. The curly parsley reminds me of a wanna be cook or of one who doesn’t know about the finer things in life that flat leaf parsley has to offer – aroma, flavor, and the ability to make a dish look really, really, pretty (like as a garnish on this soup). My opinion slightly changed when I was unable to find flat leaf parsley at my local grocery store and instead had to use the curly parsley. 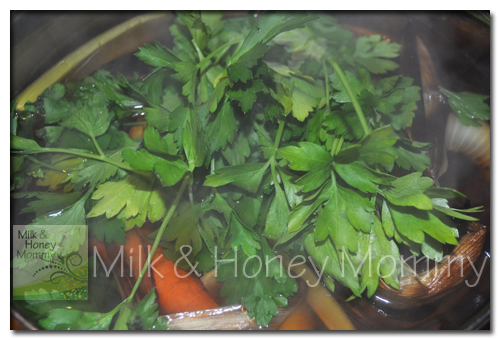 I was happy to find that this broth taste fine regardless of which parsley I use as do a few of the other cooked dishes I make. I can definitely tell a difference in taste when using either parsley raw and I still prefer the flat leaf because I think it tastes better. Do you have a preference? 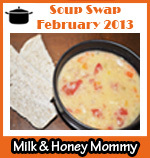 This recipe was shared with me by Monica at Healthy Green Moms when I was looking for an alternative to buying store bought vegetable broth. Although I had found an organic brand that was low in sodium and I liked, I didn’t like the price tag which added up because we eat a lot of soup. 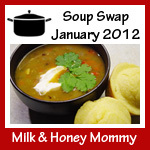 Well, it is really quick and easy to make, and you can whip up a batch and have some to use when making your next soup. 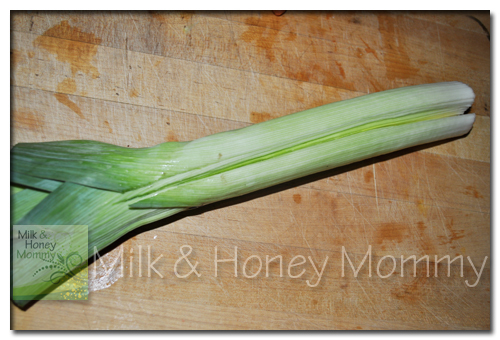 Wash the celery and carrots, and remove the “paper” skin from the onion. Do not peel any of the vegetables. I do slice the sides of the onion which helps to remove the “paper” skin more easily. 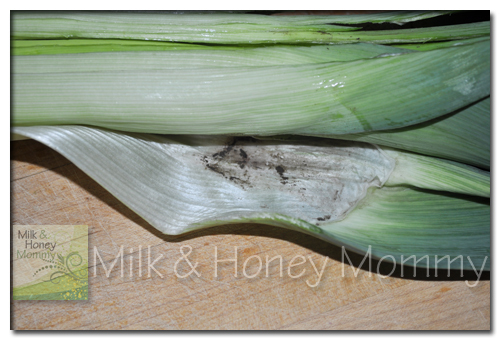 This is what most leeks look like on the inside and even though I like cooking from scratch and “getting back to my roots,” that doesn’t include eating dirt on purpose. 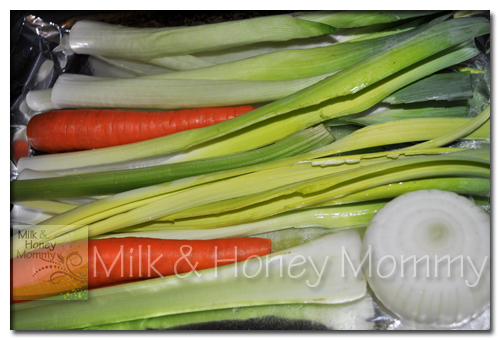 Place the onion, celery, carrots, and leek on a baking pan and roast. The vegetables will come out looking like this and yes, there may be some really burnt pieces, but that is fine. After you remove the roasted vegetables from the oven, fill a cooking pot with twelve cups of cold water. Put the roasted vegetables in the pot along. Add the bay leaf, fresh thyme, and garlic. Next comes the flat leaf parsley of choice. Then add the sea salt and simmer uncovered. 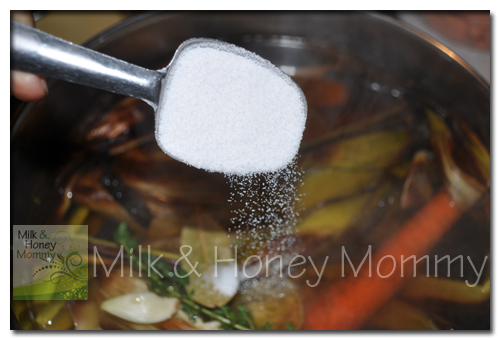 Once the broth is cooked, use a strainer to separate the vegetable and liquid and set the broth aside to let it cool. I still haven’t figured out anything to do with the cooked and wilted vegetables. Any suggestions? 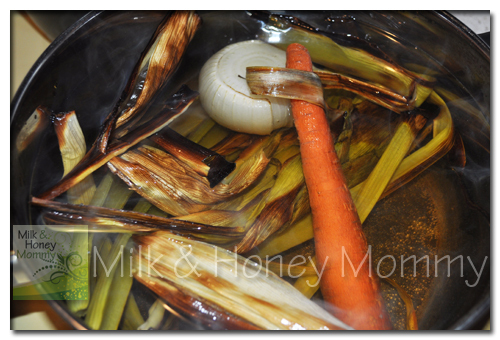 The broth can be stored up to three days in a refrigerator or frozen until ready to use. 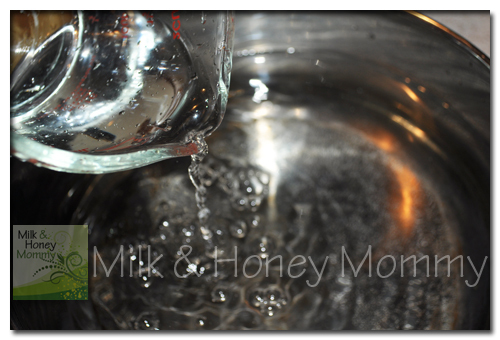 I store my broth in glass containers – used Paul Newman sauce jars, Mason jars, etc. 2. 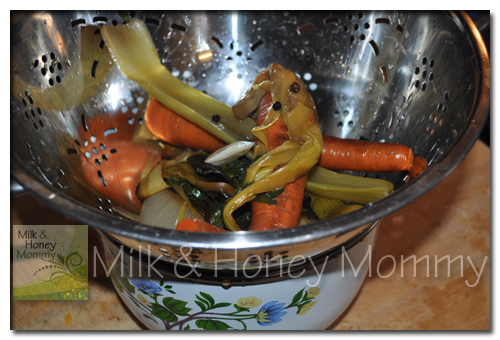 Clean carrots, celery, and leeks and set aside. 3. 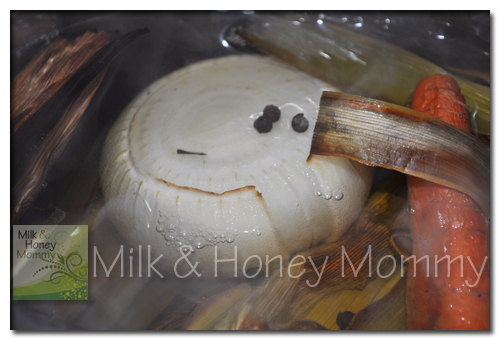 Remove “paper” skin from onion. 4. Peel the garlic and set aside. 5. 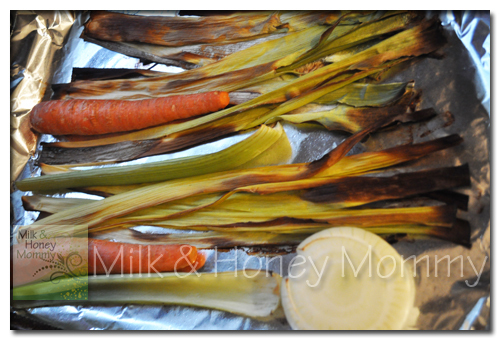 Place carrots, celery, onion, and leek on a baking pan to roast and place in the oven for 30 minutes. 6. Remove roasted vegetables from the oven. 7. Add cold water to a soup pot. 8. 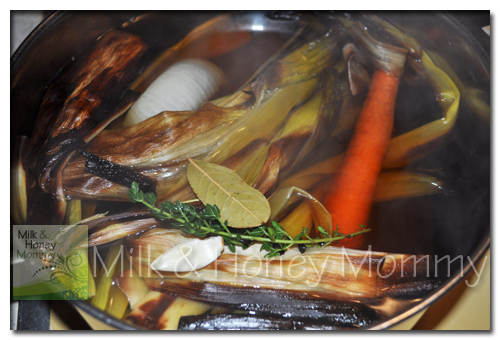 Put the roasted vegetables in the soup pot with cold water and turn temperature to medium heat. 9. Add the peppercorns, bay leaf, and thyme to the pot. 10. Add the flat leaf parsley to the pot. 12. Add the sea salt and allow the broth to simmer for 30 minutes. 13. After the broth has finished cooking, then use a strainer to separate the roasted vegetables from the liquid and allow the broth to cool before storing. 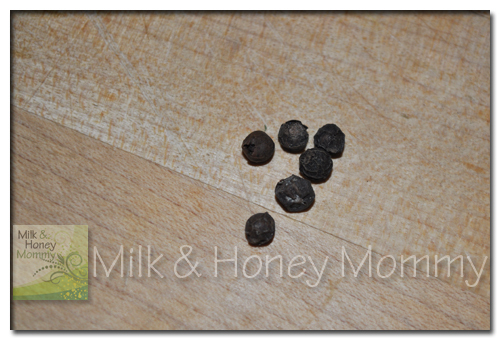 If you are ready to use for cooking, then go for it. 14. 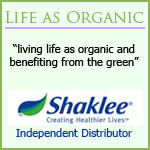 Store in a glass container and use within three days or freeze.